The Seawahaka Spring Fling was, unfortunately, a bust this year. The 8-10 knot breeze that was forecast never appeared. While nobody can control the weather, we did enjoy a great lunch at the club. but now they’re putting their toys away. Only 4 knots at JFK. It’s a great day for rowing, but not for sailing. The winter sailing series at Seawanhaka Yacht Club in Oyster Bay has seen some strange weather this year. Most Sundays have favored the light-air sailors and taxed the race committee with winds hovering between 4-6 knots. To date, however, we have managed to run 77 races and usually have an about 12 sailors who are willing to brave the cold and challenging conditions. We are approaching the end of the winter season but want to encourage all Laser sailors to come sail in the D8 Spring Fling which is being held on Saturday, April 6, 2019. 10oo hours registration; 1100 competitors’ meeting; 1200 first gun. For further registration information, contact the chair of Winter Sailing, David Kruse at WinterSailing@Seawanhaka.org. For additional D8 events, go to the D8 website, http://www.laserd8.org/schedule.htm. We are in the process of updating the D8 2019 schedule; if you have events you would like to add, please email Wyz Mooney at geewyz@gmail.com. If your Laser is laid up for the Winter, its not a bad idea to check those block eyestraps on the boom for corrosion. If they need fixing, this video shows how to do it. Race Report: The Turkey Bowl Regatta 2018 at Seawanhaka Corinthian Yacht Club! 8-9 knot breeze, lots of shifts and puffs, but as usual, the cream always rises to the top. Beautiful Fall day, lots of fun! Race Report: Dinghy Shop Fall Series, Day 5 --The 2018 Laser Fall Series at the Dinghy Shop! 6 sailors competed in 8 to 10 knots of breeze - ebb tide, not much seaweed this time! Lots of fun, one more day of racing scheduled for 10/13/18. Race Report: Dinghy Shop Laser Fall Series XXI Day 2 - Five sailors found a gorgeous day on the south shore - sun, 10 knots of breeze, and a great place to sail. Close racing between Paul & Nora- lots of place changing between them! The series continues this month into mid-October - c'mon out guys, this is a fun series. You don't have to do the whole series to participate. RADIAL MASTERS Class Series SummaryRace Points are "Low Point" points. Race Report - 2018 Ward Bell Memorial Regatta, Hempstead Harbour Club, August 18: A great turnout of 22 sailors met with a typical north shore summer breeze - from 10 kts dropping down to straight up, to sudden blasts, sunshine to rain squalls, shifts & holes rewarded the most versatile sailors. This club saw a good turnout of its own members - a good example! Visiting sailors enjoyed the great hospitality that this club always offers. Many thanks to the good folks at HHC for a fun regatta. Race Report - District 8 Grand Prix, Sayville Yacht Club August 11-12: 25 Laser sailors invaded the Sayville YC to do battle in the renowned warm lumpy waters of Blue Point, undeterred by the rainy forecast for the weekend. The lightning held off long enough for Saturday, with four races completed in ten to fifteen knots of breeze. Sunday greeted the early arrivals with a drenching sunshower, but sunscreen was needed by race time. The wind came back at eleven to fourteen. Prior champions Mike Matan and Lawrence McGrath went at it, with Mike coming out victorious by one point. BTW, the club also hosted the district championship for the Sunfish class, the very capable race commitee sending Lasers, Radials, and Sunfish around the course with no interference. The folks at Sayville know how to party - Saturday night featured a tasty BBQ, beer provided by the South Bay Brewing Company, and live music by the Urge. If you missed the action this year, make this one a must-do for next year! Please join us in a celebration of his life Friday, August 3rd, 1100 at Christ Church, 61 E Main St, Oyster Bay, NY 11771. — with J Woody Glenn and 3 others. Seawanhaka lost a lion today with the passing of J. Wooderson Glenn. Known simply as Uncle Woody to generations of Seawanhaka members he was a nearly unrivaled leader of sailing at our club and one of the most recognizable and lovable characters in our small community. As the burgee flew at half mast this evening nature paid its own respects with a beautiful rainbow over his house on the Centre Island creek. Fair winds and following seas to a wonderful shipmate and friend. Sadly, we lost Woody Glenn this week. Woody was a longtime Laser sailor (as well as Ravens, Shields, his beloved classic Herreshoff, I don't know how many other classes) and was not only a great competitor, but was always ready to help those who needed a hand, as well as those of us who didn't think we needed a hand! He certainly helped me get started in the class, and I'm sure many of us have similar stories to tell. Of course, he always brought his great sense of humor to the water. He was certainly an inspiration and will be sorely missed. Annual Dr. Hull Regatta at Southampton Yacht Club. 6 boats, 6 windward-leeward-windward races, tight competition in light airs - 1st place was decided on a tiebreaker! Many thanks to our wonderful hosts at Southampton, special thanks to Malcolm on Race Committee and Kent at the BBQ. 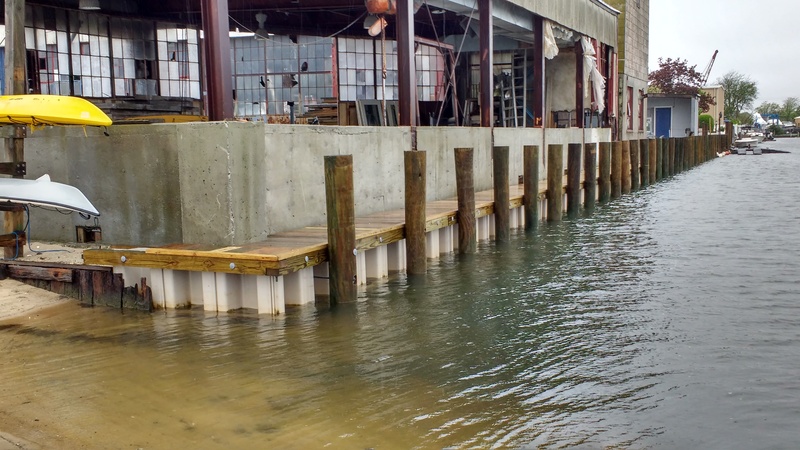 Dinghy Shop gets a new bulkhead! It rained a bit while we rigged, but four District 8 stalwarts were treated to a nice, if cloudy, afternoon. The wind was light for the most part, with a few gusts, so the races were held in Old Fort Pond, the inlet just off the Yacht Club, instead of Shinnecock Bay. The courses were short, upwind-downwind, so we got in 14, count'em, 14 starts! The racing was close, and everyone had a chance to be first and last. I tallied the score below with no throwouts - but since everyone scored at least 2 fourth places, putting in one or two throwouts doesn't change the ranking. Next week is the final for the Spring Series at Dinghy Shop in Amityville, then on June 9th we're back at Southampton for the final in this series-- the Dr. Hull Regatta. Be there! Where was everyone? Geoff Loffredo and I were the only ones to race - so we had a match racing session! Just like the last America's Cup - Geoff made a clean sweep. This was the first race in a series of three, we're scheduled again for next week. 6 sailors sailed 6 races in a breeze that started at 11 kts and died to very little. The scores don't tell the whole story, the racing was very close. Upwind/downwind, twice around, and even a modified olympic course kept the day interesting. Laser Masters World Championships, Split, Croatia - Local District 8 sailors competed in the Masters Worlds! Mike Matan scored an 11th in the Standard Rig Masters Division, Rudy Ratsep scored a 7th in the Radial Grand Masters Division (with a bullet in race 2! ), and Ryo Sakai scored a 16th in the Radial Masters Division (with a 2nd in race 4!) Click HERE for link. A note from Bob - Over the years, every now and then, I get a note from someone asking how to join a race. The short answer - just show up! We'll get you signed in at the site. We don't need advance notice, and we don't hold anyone responsible if they can't make it at the last minute (flashback to a previous years' Southampton YC Regatta, when the alternator on my tow vehicle failed halfway there!) There may be an Invitational or some other event that requires qualifying, check the Schedule, but the vast majority of our events have no pre-registration. Anyhow, just bring your boat to the next regatta that looks good to you and you're in! News, events, interesting happenings? New boat, career change, new baby? Let me know and we’ll share it on the site! This site is more than just race reports – it’s a great way for all of the good folks in District 8 to keep in touch. Just e-mail me your info for posting. For 2004 News and Scores, click here.